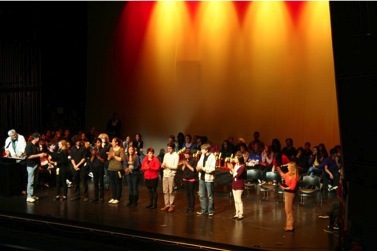 Out of 66 schools at the Drama Teachers Association of Southern California Fall Drama Festival at Central LA School for the Visual and Performing Arts on October 30, Carlsbad High School placed in the top ten in Sweepstakes. In the Tech categories, Sets and Lighting Designs by William Catlin, Jay Rodriguez and Gabe Torres won first place, and the Graphics and Publicity Designs by Jessica Jennings, Nick Timm, and Jeremy Waits ranked in the top ten. 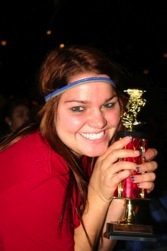 placed fourth and Hannah Long was sixth for her Audition Pieces. Honorable Mentions (top ten) were also won in the Noel Coward event (Sean Geisterfer, Martha Mallory, Chris Ohlin, Tina Samsamshariat), Pultizer Prize plays event (Shireen Ayazi, Mischa Bateman, Alex Patterson, Brianna Wood), and Group Serious (Brian Brennan, Chelsea Staley, Ashley Werwage). Group Humorous (Alec Beretz, Adelie Carstens, Stephan Deemer, Shane Francis, Jon Fuson) placed in the semi-finals. BRAVO! 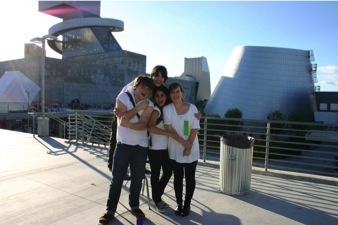 Carlsbad Dominates at Shakespeare Festivals! 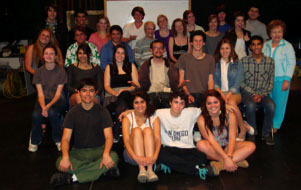 The Carlsbad High School Advanced Theatre students took 2nd Place Sweepstakes out of 49 high schools at the Drama Teachers Association of Southern California Shakespeare Festival at Fullerton Union High School. First place was won by the &quot;Shakespeare’s Musical&quot; group of Nick Bennings, Alec Beretz, Rachel Davis, Kim Gosnell, Trio Harris, Teddi Johnson, Jamen Nanthakumar and Jessica Zoutendyk with their student-created piece from Hamlet. 2nd Place trophies were won by Justin Feinman, Emily Kuperman, Chris Ohlin and Tina Samsamshariat for their cutting from Twelfth Night and the King Lear group (Brian Brennan, Shane Francis, Sean Geisterfer, and Ashley Werwage). Mischa Bateman won 3rd place and Chris Taylor won 8th place out of over 80 monologues.&nbsp; Adelie Carstens and Martha Mallory won 4th place for their scene (all in French) from King Henry V. The Sets, Lights, and Graphics created for King Lear by William Catlin and Gabe Torres won 5th place, and costumes by Sheila O’Neill and the team of Stephan Deemer and Mark Patricio placed in the finals. Reaching the semi-finals were Shireen Ayazi, Hannah Long, and Brianna Wood with their scene from Titus Andronicus. 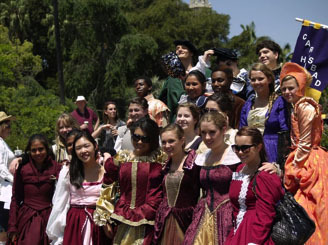 At the San Diego Shakespeare Society Student Festival in Balboa Park on Saturday, the award for Best Performance for Tragedy was won by PreAdvanced Theatre students Myzell Harris, Rebekah Klein, Nico Raisbeck and Laura Parker for their 10-minute piece from Othello. Performances of Much Ado About Nothing and the “How Sharper Than A Serpent’s Tooth…” Collage drew huge crowds on the Prado. 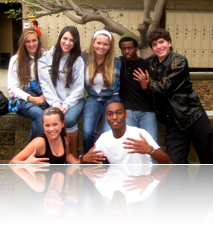 The PreAdvanced Theatre students were featured on KPBS San Diego’s &quot;San Diego Week&quot; on Friday night, April 29, at 8.